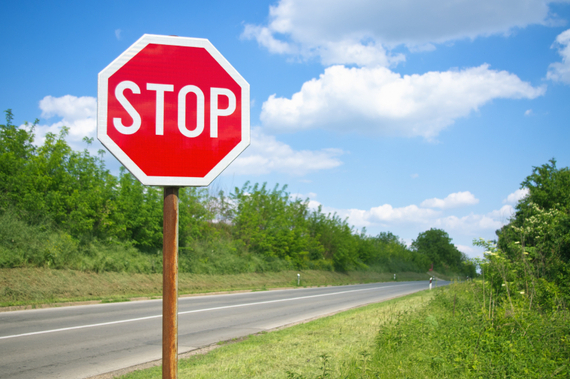 Most people think the stop sign was created to regulate traffic. Not true. According to Dr. Ellison Burke of the Global Institute for Slowing Things Down Before You Hurt Yourself Badly, the origin of the stop sign has nothing to do with traffic -- and dates back several thousand years. My research doesn't end here, however. In each of the above-mentioned civilizations, there have always been a small, but vocal group of citizens who, concerned about the quickening pace of daily life, have warned the masses about this dangerous phenomenon. In Sumeria, for example, a fringe group of philosophers and poets routinely posted "Styopsian" signs at strategic intersections throughout the country -- not to stop traffic, but unnecessary "mind movement". Their effort resonated with the citizenry and eventually led to the widespread appearance of what modern day sociologists now refer to as "stop signs" -- in urban centers, villages, and crossroads. And so... the next time you see a stop sign, you may want to remember that you, no matter where you think you're going, or how quickly you think you need to get there, are, in fact, in the act of receiving an ancient teaching -- one that preceded Facebook, Instagram, Snapchat, texting, and Donald Trump tweeting in the middle of the night. NOTE: It has recently come to my attention that some readers of this article have questioned my research methods and the veracity of my findings. A quick Google search of "Dr. Ellison Burke" and the "Global Institute for Slowing Things Down Before You Hurt Yourself Badly," they claim, reveals not a single link. Frankly, I am baffled by their assertions and have assigned five of my brightest research assistants to get to the bottom of the matter. In the meantime, as I put to rest the niggling, naysaying concerns of my detractors, you may want to contemplate the timeless words of modern-day social scientists, Simon & Garfunkel: "Slow down, you're moving too fast, you gotta make the morning last." Mitch Ditkoff is the Co-Founder and President of Idea Champions, an innovation consultancy headquartered in Woodstock, NY. His most recent book, STORYTELLING AT WORK: How Moments of Truth on the Job Reveal the Real Business of Life, was awarded a Bronze Medal in the 2016 Axiom Business Books contest. Here is proof that he has stopped at a stop sign at least once in his life.